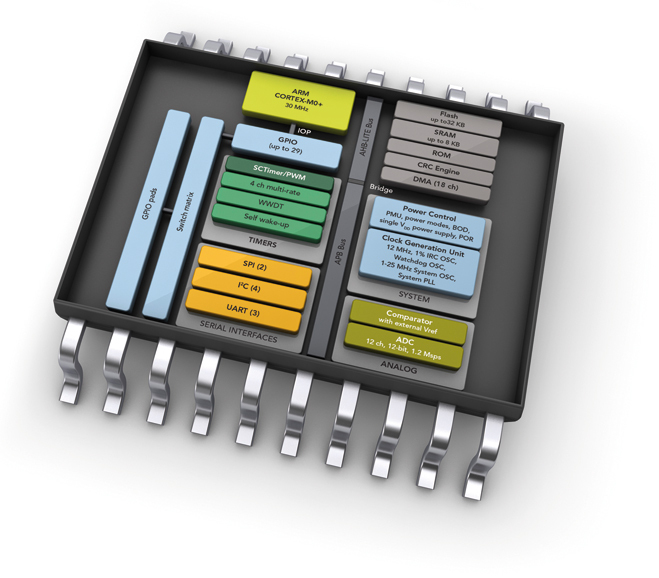 Every application for a microcontroller needs drivers for its internal peripherals. The Embedded SDK includes integrated peripheral drivers that utilize features of the real-time kernel to optimize performance. The Embedded SDK source code archive contains a directory for each supported microcontroller (MCU). The MCU directory contains a collection of drivers for the on-chip peripherals. Each driver begins with an "mcu_" and contains a single source (.c) and header file (.h). For example, the analog-to-digital converter (ADC) driver is comprised of files "mcu_adc.c" and "mcu_adc.h". To use the driver, add mcu_adc.c to your project and include mcu_adc.h to get access to the driver's API. mcu_kernel.c/.h - Performs MCU specific tasks for the kernel. mcu_irq.c/.h - Provides support for the MCU specific interrupts. mcu_pin.c/.h - Provides support for reading and writing of the MCU pins. mcu_start.c/.s - Provides start-up code for the MCU. Provided for each toolchain. All other drivers are optional and can either be included or excluded from compilation depending upon the requirements of application. Don't see the driver you need? Contact Us or Submit a Support Ticket to request the driver you need. We'd be glad to add the driver for you.